Michelle’s Café coffee beans are roasted at Kiva Han. Kiva Han offers you the world’s freshest, most flavorful coffee. Using only the highest grade Arabica beans, Kiva Han coffee is harvested from select regions from around the world. Grown at elevations about 3,000 feet and with an extended growing cycle, Arabica beans are plumper and contain more oils and flavor than robusta beans, the typical store-brand coffee bean. To ensure the finest quality of each aromatic cup, Kiva Han chooses only the freshest, plumpest beans and only roasts on demand. Often considered the best coffee in the world. Grown high on the slopes of Mt. Kenya where the temperate climate, volcanic soil, and seasonal rains produce a mellow and well-balanced coffee. The flavor includes hints of citrus and black currant, accompanied by an almost intoxicating floral aroma. America’s most popular coffee. Full bodied and balanced with a sweet flavor and satisfying aroma. These beans are “moonsooned”, spread across the floors of specialty built huts throughout the rainy season to recreate the water logging effects of the long ocean voyage between India and Europe in the past. This process creates an earthiness and unique flavor. Mexico’s highest-grade coffee grown using organic farming methods on a fair-trade certified farm. This coffee has an earthy taste and mild flavor. These beans are cultivated on the steep volcanic slopes of Mt. Leuser in the Mandheling region of Sumatra. Its herbal aroma and complexity make it a favorite of many. Brazilian beans are extremely popular, making up 30% of the worlds coffee consumption. These 100% highest-grade Guatemalan Arabica beans have a dry and delicate aroma with a taste hinting of smoke, snap, and zest. Costa Rican beans offer a great balance and crisp acidity, offering a clean follow-through. Good body and chocolaty finish add impact to this well-bred coffee. Panamanian beans are known for their consistent quality. Cerro de las Ranas means mountain of frogs and this estate coffee grows high on this mountain creating a truly rich coffee. An American original. The small growing region of the Kona Coast on the big island of Hawaii produces a truly unique coffee. Kona coffee is very aromatic and is a treat to be experienced. Considered by many to be the best coffee in the world. Grown high in the Blue Mountains of Jamaica. Jamaican coffee is smooth with a very full body and aroma. 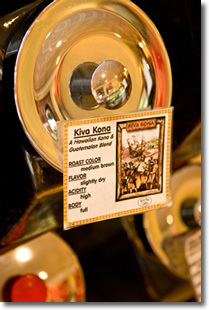 The Kiva Han Blend is designed to create the perfect espresso. A tantalizing blend of Brazilian and Guatemalan beans, it has a mild chocolate introduction followed by a nutty middle, and a soft, sweet finish. Kiva Han is perfect for espresso and equally good for traditional coffee. A blend of the highest grade Kona and Guatemalan beans. This coffee offers high floral notes and a smooth buttery finish. A blend of Ethiopian and Javan beans. This is a delicious, full-bodied coffee. Louis XIV boasts a complex aroma with a spicy flavor and syrupy body. A blend of Central American and African coffees, this coffee is always one of our most popular. This blend has body, complexity, and brightness. 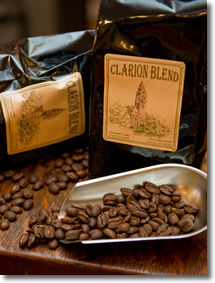 All flavor coffee uses Brazilian Santos beans and roasted in flavored oils. Flavors Include: Caramel, Golden Pecan, Hazelnut, La Vanilla, and a flavor of the month.